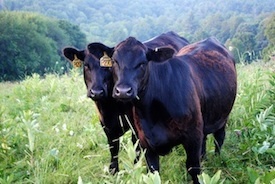 Enjoy delicious natural Angus beef from Cloudland Farm that is raised with NO added hormones. Our beef is grown on a strictly vegetarian diet without antibiotics. Cloudland’s Angus beef cattle are grass-fed and finished with a minimal amount of cracked corn to give the beef a light marbling that contributes to its juiciness. All grain that we feed is non-GMO. 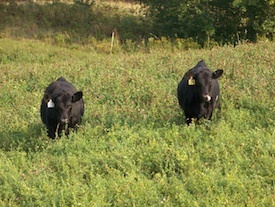 Our Vermont raised Angus beef is processed under USDA inspection. To enhance tenderness, it is dry-aged for two weeks before cutting. Our butcher vacuum seals each cut, and then it is immediately frozen. Bulk orders are available for families wishing to purchase a half or quarter of a beef to fill their freezer. Individual, frozen beef steaks, roasts, ground beef, organ meats, and specialty beef products are offered for sale throughout the year at the Cloudland Farm Market and through our fall and winter Meat CSA (community supported agriculture) shares. Contact us if you desire special cuts and we will do our best to accommodate you.